Card Text Each other friendly Beast creature gets +1 power. Each other friendly Niffle creature gets +1 power. 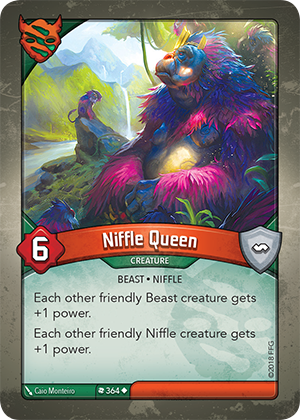 If Niffle Queen leaves play and I have a Niffle and/or Beast creature whose damage is now equal to (or greater than) its new (lower) power score, is the creature destroyed? Yes. If at any time a creature’s damage is equal to or greater than its power, it is immediately destroyed. Therefore, if you have a Niffle and/or Beast creature with 4 damage and 5 power (including the bonus from Niffle Queen), when Niffle Queen leaves play the creature’s damage will be equal to or greater than its new (lower) power and it is destroyed.